* Whisk together milk and espresso powder and bring to a boil in a small, heavy saucepan. Whisk together yolks, sugar, and a pinch of salt in a bowl. Slowly add hot milk to yolks, whisking constantly. Transfer custard to cleaned saucepan and cook over moderately low heat, stirring constantly with a wooden spoon, until it registers 170 degrees Farenheit on an instant read thermometer and is think enough to coat back of spoon. * Pour custard through a very fine sieve into a metal bowl. Put bowl into a larger bowl filled with ice and cold water and cool custard, stirring occasionally. Chill, covered, until ready to use. * Preheat oven to 400 degrees Farenheit. Butter baba au rhum molds and dust with sugar, knocking out excess. * Melt butter and chocolate in a double boiler or a metal bowl set over a saucepan of barely simmering water, stirring occasionally. Remove bowl from pan and cool slightly. 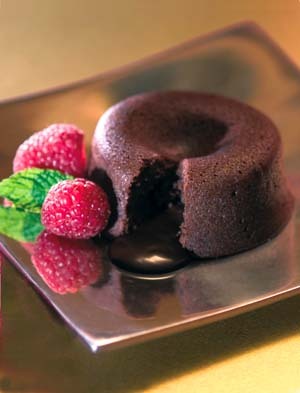 * Whisk together eggs and 6 1/2 tablespoons sugar in a bowl, then whisk in flour, melted chocolate, and salt. Pour into molds, filling them about two-thirds full, and put molds in a 9-inch metal baking pan. Bake in middle of oven until outer 1/2 inch of cakes are cet but centers are still moist, 10 to 12 minutes. * Holding 1 mold with a potholder, run a knife around edge of cake to loosen, then invert onto a plate. Unmold remaining cakes in same manner. Serve with coffee creme anglaise. Makes 6.